Based on the comments on my site and on Facebook, twins fighting is a BIG problem for families with multiples. 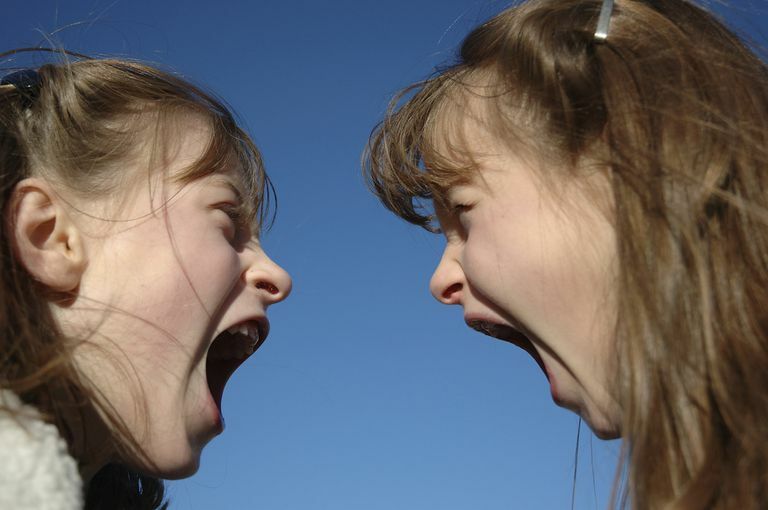 The day-in-day-out squabbles and spats make parents want to tear their hair out. I have identical twin little girls that will be three soon. They cuddle and kiss a little bit, but mostly they bite, hit, smack, and fight over everything. Even if they have the same toy, they each want what her sister has. -- Mindy "I have B/G 22M old twins. The fighting is constantly, and my daughter bites my son so much, I think he is afraid of her! I have tried time outs, spanking, and bribing and nothing seems to work." -- Mom of b/g twins "I have twin girls turning 5 in december. ... They used to fight at home but now the problem is at school. ... Although they are separated, play time is the same. If one play with other kids ... the second one gets jealous ... I have talked a lot with them but nothing is working….how do (you) separate two kids living in the same house? They want to eat, drink, play, etc., the SAME…no matter where!" -- f "We have nine kids, the youngest being identical twin girls that are 2 1/2 years old. Our Oldest is 24, so we have lived through a lot lol but none of our other children ever hit each other, bit, etc. The relationship between twins and multiples is definitely complicated. On the one hand, they are blessed with built-in buddies. Yet they are also subject to constant comparison and competition. Just as in any relationship, there will be tender, loving moments, and times of dissension and disagreement. The fighting between multiples can be particularly intense. Multiples tend to spend more time together than traditional siblings; they may share a room, have the same friends, and are usually in the same grade. They may even be in the same classroom. Without a birth order dynamic to establish natural boundaries, they have to work harder to gain privacy and identity. For the most part, twins and multiples probably enjoy being together, but there will also be times of tension. Often, it begins in toddlerhood, when young children lack the communication skills to express their feelings and desires and instead lash out physically. They may bite or pull the hair of their co-multiple. There are numerous strategies for managing conflict between multiples. What is effective for one family is less useful for another. But there are some basic guidelines that you can adapt and modify based on your multiples’ ages and circumstances. One strategy is to employ neutrality. Avoid an impression of favoritism by utilizing neutral systems for establishing rules and guidelines within your family. For example, chore charts can identify and track each child’s responsibilities. Color-coding or labeling establishes ownership of possessions to reduce squabbles. Take turns by days of the week to designate privileges or conduct schedules, for example, Twin A goes first on even days and Twin B goes first on odd days. Set expectations of respect among family members; offer praise when it is exhibited, and discipline with appropriate consequences when it is violated. Establish boundaries to provide opportunities for individual privacy and possessions. Create a safe environment for healthy disagreement by listening to both parties and responding. Utilize time-outs, both for kids and the objects of their disagreement. If they are fighting over a toy, put the toy in time out until they can work out an arrangement to play together or share it. Sometimes, squabbles originate simply because multiples need a break from each other. However, they can’t always articulate this need. Too much togetherness is tedious for anyone! When the fighting ramps up, split them up. Send them to separate corners or even separate rooms. Arrange separate play dates and spend one-on-one time with each child. Time out can be a tool and does not have to be a punishment. Intervene minimally. Act as a mediator when necessary, but allow your multiples to resolve conflicts between themselves. Keep perspective. This “two” shall pass. Sibling conflict is normal and sometimes beneficial. Despite the aggravation it causes now, they will most likely grow up to be very close. And they’ll learn some negotiating skills along the way. Finally, release your parental quest to keep everything fair and equal between your multiples. It’s an impossible quest, but a pattern that is very easy to fall into when parenting multiples. From the outset, you feel compelled to “do for one, do for the other.” While that may be reasonable when caring for newborns, it quickly becomes burdensome and unfairly presents your multiples with an expectation of entitlement. While you love them equally, life will not treat them equally. Children need to understand that there will be situations when one receives advantages over the other, but that the tables will turn in time.